The Province of Granada (919,319 inhabitants in 2013; 12,531 sq. km) is located in the south-east of Andalusia. The flag of the Province of Granada (photo), approved on 26 February 2008 by the Provincial Council and submitted on 3 March 2008 to the Directorate General of the Local Administration, is prescribed by a Resolution adopted on 10 March 2008 by the Directorate General of the Local Administration and published on 28 March 2008 in the official gazette of Andalusia, No. 61, p. 56 (text). Flag: Rectangular, in proportions 2:3, the length - from hoist to fly - one and a half the hoist, of the traditionally used green colour (Pantone 384c), charged in the middle with the proper coat of arms of the Provincial Council of Granada, on both sides. The Nasrid Kingdom of Granada is represented on several maps and portolanos by a red flag ending in a point and inscribed with the first surah of the Quran, "There is only One God" in Arabic letters. During the last years of the Granada Wars, the troops of the Catholic Monarchs captured several Nasrid standards, of diverse design, mostly red, green, and white. Those standards were included in their arms by noble lineages involved in the reconquest, such as the houses of Alba, Medina Sidonia, and Aguilar. When the provinces were established in 1833, proper arms were deemed necessary while flags were not. There is no documentation on any provincial flag before the 1970s, when the Province used a light green flag charged with the coat of arms approved in 1969. Banderas y Escudos de las provincias de España [e9s92], published in 1992 by the Instituto Nacional de Administración Pública, describes the flag as "zinc green with the proper arms of the province in the center". The Provincial Council initiated the process of official registration. The memoir supporting the proposed flag refers to the colour as "Umayyad green / Andalusian flag", highlighting both the historical period of Al-Andalus and the present and future periods of Andalusian autonomy. While the norms of vexillology would recommend for the flag a white background, taken from the coat of arms, Umayyad green "perfectly matches" the colour of the Nasrid standards captured during the Granada Wars. The Provincial Council - two Councillors abstained from voting - decided to keep the "zinc green" colour, specified as Pantone 384c. Following the modification of the coat of arms adopted in 2013, the former flag of the Province was updated accordingly. This did not change its description, which was left untouched. The coat of arms of the Province of Granada, approved on 21 December 2012 by the Provincial Council and submitted on 28 January 2013 to the Directorate General of the Local Administration, is prescribed by a Resolution adopted on 8 April 2013 by the Directorate General of the Local Administration and published on 17 April 2013 in the official gazette of Andalusia, No. 73, p. 55 (text). Coat of arms: Argent fimbriated gules a pomegranate proper faceted gules slipped and leaved vert. A bordure compony of eight pieces: in turn, four pieces "Argent a lion rampant gules langued of the same crowned and armed or", four pieces "Gules a castle or port and windows azure masoned sable. An outer fimbriation sable charged with a two- stranded wattle argent. The shield surmounted by a Royal crown closed. In the lower part a cartouche inscribed with "EXCMA. DIPUTACIÓN PROVINCIAL DE GRANADA". The former coat of arms of the Province of Granada (image; official presentation), approved on 26 February 2008 by the Provincial Council and submitted on 3 March 2008 to the Directorate General of the Local Administration, was prescribed by a Resoluytion adopted on 10 March 2008 by the Directorate General of the Local Administration and published on 27 March 2008 in the official gazette of Andalusia, No. 60, p. 55 (text). The wording of the 2008 and 2013 Resolutions is exactly the same, the only difference being the addition in 2013 of the cartouche inscribed with the honorary name of the institution. The arms are canting, since granada means "a pomegranate" in Spanish, the pomegranate tree (Punica granatum L.) being called granado. The word comes from Latin granatus, "with grains", while the tree was called in classic Latin Malus punicum or Malus granatum, Malus being the apple-tree (hence the origin of "pomegranate" and of the German word Granatapfel). The origin of the name of the town of Granada is disputed, but might well have been derived from the name of the fruit. The oldest known heraldic representations in Granada dates back to the Nasrid kingdom; the arms of the reigning dynasty, "Gules a bend or inscribed with "Only God Triumphs" in Arabic letters, can be seen in several places in the Alhambra. In 1492, the Catholic Monarchs celebrated the reconquest of the Granada by adding a new quarter to the Royal arms, "Grafted in base argent a pomegranate proper faceted gules slipped and leaved vert. Since then, the old Kingdom of Granada has been represented this way, as can be seen in the arms of Charles V and in the present-day's arms of Spain. A few alternative representations exist: in some German armorials, Ferdinand the Catholic is portrayed holding two shields, in the right arms quarterly Castile and León, in the left arms, a shield featuring eight pomegranates representing the eight most important towns of the Kingdom of Granada. When the Province of Granada was established in 1833, it was considered as the traditional successor of the old Kingdom of Granada, whose arms were placed on an oval shield (usually reserved to women in Spanish heraldry). A few years later, official documents were sealed with a chasuble-shaped shield, featuring the pomegranate hold by two interlaced hands and surmounted by a Royal Spanish crown. During the Republican period, a mural crown was used instead. The hands were sometimes omitted. Anyway, the coat of arms was never officially approved. In the center of the shield, the traditional arms of the town of Granada; all around the arms of the towns capitals of judiciary parties in twelve fields or quarters, in circular order: Guadix, in the center as the oldest town, Baza, Huéscar, Albuñol, Iznalloz, Motril, Ugíjar, Loja, Montefrío, Santa Fe, Órgiva, and Alhama. The shield surrounded by laurel leaves and surmounted by leaves and volutes argent. As for the town of Granada, lambresquins surmounted by a crown identical to that used on the model arms. Approved by the Provincial Council, the proposed arms were rejected by the Royal Academy of History and Arts of Granada; the design was deemed little compliant with the rules of heraldry and excessively complex. It would be appropriate for a judiciary body, but not for a territorial administration. The Academy proposed two models more compliant and simple; "Argent a semy of pomegranates proper" and "Argent a pomegranate proper a bordure of castles and lions". The Provincial Council maintained the original proposal, which was forwarded to the Ministry of Government for approval, arguing that the proposal "fulfilled the aspiration of all the towns of the province", that a similar design was used by the Provinces of Madrid, Seville, etc., and that the design of the arms was "compliant with the special characteristic of the provinces, defined as 'groups of municipalities' in the Law on Local Regime". The Council accepted the recommendation to use the Royal crown of the Catholic Monarchs. The Ministry required the Provincial Council to follow the Academy's recommendations, to no avail. Parrizas submitted another proposal featuring only one pomegranate, but nothing happened. In 1967, the Office of the Head of State required the official design of the arms of the province. In May 1969, the journalist and historian Eduardo Molina Fajardo presented a detailed study of the different arms used by the Provincial Council since its establishment. He concluded that the pomegranate had always been the symbol of the province and that, "accordingly, a single pomegranate should be used on the arms", as used since the beginning. He admitted that the bordure of castle and lions suggested by the Academy could be added to the shield. A pomegranate on a field argent, proper, open and with grains gules, framed by a bordure of castles and lions forming cantons separated by rectilinear lines, surmounted by the crown of Queen Isabel the Catholic, beneath the shield a scroll inscribed with "Excma. Diputación Provincial de Granada". Immediately used, the arms were submitted both to the Directorate General of Local Administration and the Royal Academy of History, for official approval. No answer was ever received, so the Provincial Council used unregistered arms for more than 30 years. In November 1994, David Torres Ibáñez informed the Provincial Council of the unofficial status of its arms and proposed to "rehabilitate" the oval shield, to be surmounted by the Royal crown of the time. Lorenzo Vera and J. Fernando García, graduates in protocol and institutional relations, were commissioned by the Provincial Deputation to write a memoir supporting a design compliant with the norms of heraldry. 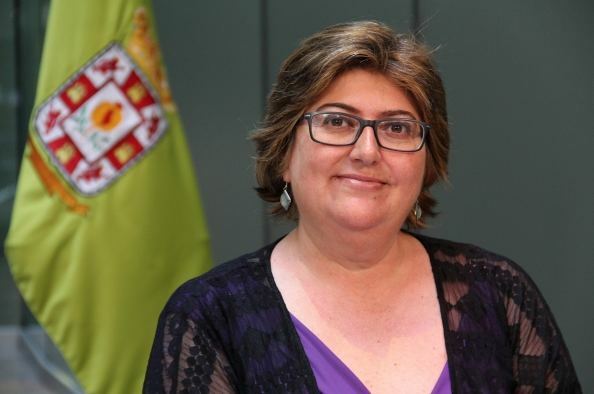 The memoir was adopted - only one Councillor abstained from voting - and the heraldist Julia Vañó was commissioned to design the arms that were eventually adopted in 2008. 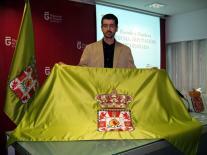 The former flag of the Province of Granada (official presentation; photo, photo) was charged with the former coat of arms, also adopted in 2008. Banderas y Escudos de las provincias de España [e9s92], published in 1992 by the Instituto Nacional de Administración Pública, describes the flag adopted in the 1970s as "zinc green with the proper arms of the province in the center".